Страж Маски Жизни и союзник Тоа Иника. Воин с большим топором. Mysterious fighter for the Light! 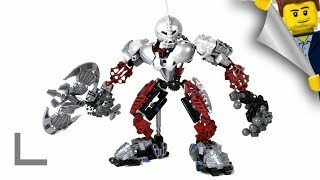 Immensely powerful, Axonn was a champion of justice long before the first Toa ever came to be. He has vowed to fight the Piraka and keep them from stealing the Mask of Life! Axonn wears the Kanohi Roden, the Great Mask of Truth, which can pierce any disguise and spot any deception. His enormous axe can cleave a mountain in half, and fires pure energy from its blade! Axonn stands over 9" (over 22cm) high! Includes Great Mask of Truth!